Golden Fer - Kenya Biologics Ltd.
GOLDEN FER is a soil conditioner composed of 6% of iron chelated by EDDHA, of which 4.8% is present as the ortho – ortho isomer. It is suitable for all types of agricultural crops. 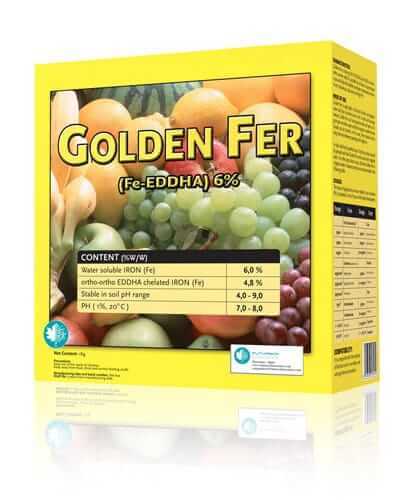 GOLDEN FER provides stability and helps to maintain iron in calcareous soils or at high pH, favoring good concentrations of the mineral in order to preserve the health of crops upon its application. GOLDEN FER can be applied to all types of soil through irrigation systems and water or directly in soil. In medium-textured soils GOLDEN FER can be sprinkled on the soil bed at a concentration of 10g/L and then proceeding with irrigation on the shadow parts. In this case, you should not spend a lot of time between application and irrigation of the fields. In soils with a harder bed layer, you must first remove the surface and then apply GOLDEN FER with irrigation water. To be applied directly to the crops, dissolve GOLDEN FER in irrigation water, and use as it is described in the table of recommended doses. GOLDEN FER is stable for at least three years since manufacturing date. Store in the closed original container in a cool and ventilated area. DO NOT store for prolonged periods in direct sunlight. Keep away from food, drink and animal feed. Keep out of the reach of children. GOLDEN FER is compatible with most fertilizers and agrochemicals commonly used on the recommended crops. If possible, perform a compatibility test in a small volume. Pome and stone fruits 50g/tree Apply at the beginning of production. 70g/tree Apply at the middle of production. 100g/tree Apply at the maximum capacity of production. Cucumber, tomato 200g/1000m2 Apply in the stage of vegetative growth. 300g/1000m2 Apply at the beginning of production. 500g/1000m2 Apply at the maximum capacity of production. Ornamentals 50g/m2 Apply at any moment of the cycle. Horticultural crops 2 – 4 Kg / ha Apply at short cycle. 3-5 Kg / ha Apply at long cycle. Citrics 70g/tree Apply at the beginning of production. 100g/tree Apply at the middle of production. 150-200g/tree Apply at the maximum capacity of production. Pistachio 50g/tree Apply before crop. Olive tree 50g/tree Apply before crop. Grapevine 20-50g/plant Apply in any moment of the cycle. Strawberry 2 – 5 Kg / ha Apply at any moment of the cycle.